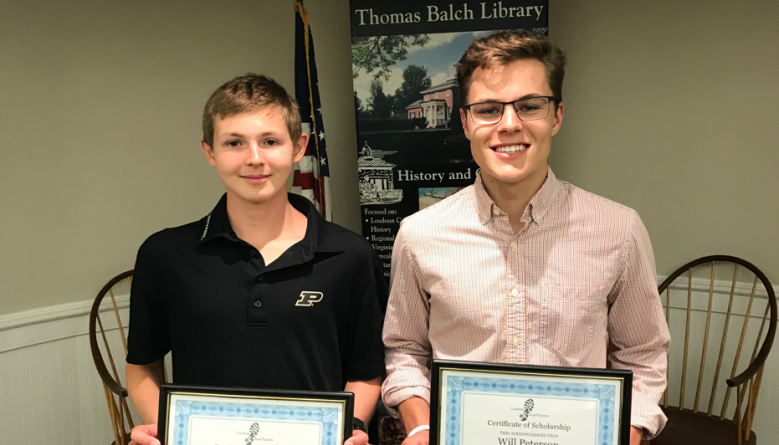 The Loudoun Road Runners awarded two $1,000 scholarships to recently graduated Loudoun High School students last Thursday at the Thomas Balch Library. The recipients were Brandon Dimitri, a Briar Woods High School grad who plans to attend Purdue University, and Will Peterson, a Loudoun County High School grad who plans to attend the University of Virginia. They were chosen by a committee from 16 applicants. The final decision was heavily based on the applicant’s essays. Dimitri wrote in his essay, “Running has helped me grow from a follower into a leader.” Peterson’sessay described his respect for his parents. “I’ll admit I wasn’t the easiest child to raise, having been born 16 weeks early at a whopping one pound, as well as fighting cancer twice,” he wrote. The Loudoun Road Runners aims to promote running as a lifelong endeavor for athletes of all ages and abilities.